One of the traditional organic oils used today is black spruce essential oil. This well-revered oil has been used by indigenous populations throughout time in North America. The natural healing oil is derived from conifer trees, or those trees that are part of the pine (Pinaceae) family of plants. While the needles of the spruce tree may not reveal much externally, both the needles and twigs are made of chemicals that provide amazing healing benefits. Native Americans from the U.S. and First Nations tribal members in Canada would travel long distances just to collect black spruce twigs and needles to boil and distill the extracts. Extraction was used to provide medicines for healing. This type of ancient wisdom is still passed down today by the sale of black spruce essential oil online and in the alternative health marketplace. The oil, which is primarily derived from black spruce trees in Canada, Alaska, and the northern U.S., was used in former times by the Lakota Indians. The Lakota Indians would collect the oil from swampy and wet places. The needless, which were notably sharp and bluish-green in hue, are the primary components used in extraction. When tribal people used the oil, it was used to heal wounds after tribal skirmishes and to help with relaxing the muscles. The oils were used to fight arthritis and proved to be an elixir for relieving joint pain. Many tribes on the North American continent used black spruce essential oil to relax the mind and as a disinfectant. The oil was used often in traditional and spiritual rituals, including meditative practices. The botanical name for the oil is Picea mariana and the plant species from which it is derived is also synonymous with the Canadian black pine. The aroma of the oil is mesmerizing as it conveys a fresh pine scent with a nuance of a sweet undertone. Research shows that black spruce essential oil can stimulate the production of hormones throughout the body. Both the hypothalamic pituitary adrenal axis (HPA) and thymus bland benefit when black spruce essential oil is used. The oil releases certain bio-chemicals for restoration and healing. Black spruce essential oil has terpenes — monoterpenes and sesquiterpenes — that feature molecules that are made of hydrogen and carbon. This combination makes it possible for the oil to be used for inflammatory ailments such as arthritis. The terpenes found in black spruce essential oil are designed to safeguard the black spruce plant from environmental exposures or stress. That is why the derived oil can be used for restoration and healing. Coniferous trees are regarded for the terpenic and resinous aroma, which is normally associated with a pine forest. Oils such as black spruce essential oil are obtained quite often from hydrodistillation of the needles. The black spruce is considered an important industrial plant in the boreal forest of Canada. The foliage that is left from logging operations is used to produce essential oil. The chemical properties of black spruce oil are similar to other essential oils that are distilled or removed from conifer trees. Compared to similar oils, the composition of black spruce essential oil is unique because of its sweet, distinct aromatic smell. It also warms the skin when it is applied. Black spruce oil is thinner than other essential pine oils and can range in hue from transparent to a mild yellow color. Its color depends on its potency. Most of the chemicals that make up the oil are categorized as monoterpenes. Because monoterpenes can directly affect the brain in ways unlike other chemicals, they provide both relaxing and calming benefits. This feeling of calm is not felt as strongly by similar oils with relaxing properties. The oil is also known to contain sesquiterpenes that, along with monoterpenes, give the oil its anti-inflammatory properties. Both of these terpenes are used in the pharmaceutical industry. Both terpenes reprogram a DNA code and can be used to treat cancer where a malignancy results from improper coding. The oil can be derived from water distillation or from steam distillation. Both of these distillation techniques produce similar yields when they are evaluated using mass spectrometry or gas chromatography. The essential oil composition is very similar to turpentine with the majority of the oil made up of α-pinene and β-pinene and supported by a large number of monoterpenes. Because black spruce essential oil has been used traditionally and for a long time, it has been proven to be beneficial in various ways. This all-natural healing oil provides a holistic remedy to a number of mental or physical complaints. Below are some of the key uses for the oil. Black spruce essential oil is helpful in providing a calm, focused mind. The oil is used in aromatherapy to make a person feel less anxious and stressed. Using an infuser can produce calming and mentally balancing effects. Natural esters in the oil produce this type of effect. Besides being a mental relaxer, black spruce oil proves to relax the body. The oil contains antispasmodic properties that relax the user physically. Black spruce essential oil can also be used to help treat a range of respiratory issues such as symptoms associated with the common cold and bronchitis. As well as its expectorant properties, the oil conveys antioxidant support that can help strengthen your body’s defenses and protect against common respiratory illnesses. By inhaling black spruce essential oil or massaging it into your chest, you can help expel the build-up of mucus in your respiratory system allowing you to breathe more freely. This oil contains polycyclic terpenoid components that serve as a tonic for the adrenal, thyroid, and pituitary glands. When this happens, it produces a hormonal balance throughout the entire body. This type of equilibrium makes the user think more clearly and feel more energetic. He or she may also experience clearer skin. As people age, their joints or muscles lose lubrication. The wear and tear that results is keenly felt without a remedy. The biochemical constituents of black spruce oil, when combined with other oils, provide substantial benefits that assist in relaxing the muscles and lubricating the joints. It also improves blood circulation. People who use black spruce essential oil as a joint and muscle relaxer experience almost immediate results from degenerative conditions including arthritis. The oil restores the cartilage and reduces inflammation. It prevents additional wear and tear that keeps a person from feeling agile and mobile. As well as being used to treat muscular issues, black spruce essential oil can be massaged into your joints and bones to help relieve joint pain. People with conditions such as rheumatism or osteoarthritis may well benefit from black spruce oil’s analgesic and anti-inflammatory properties. Before you apply black spruce oil topically as part of a massage treatment, you should be sure to dilute the oil first with a suitable carrier oil like jojoba, olive oil or coconut oil. Because black essential oil improves adrenal gland functioning, it can be used to fight the effects of winter depression or to help a person suffering from chronic fatigue or tiredness. While a blue light is often used for seasonal depression, you can also use black essential oil to add “sunlight” to your mood. When it comes to treating emotional issues like depression and anxiety or stress you may find you need to try a range of essential oils before you hit on the one that is best for you. While essential oils are unlikely to have an effect on severe cases of depression, they can help to alleviate the mood and may be very effective in treating mild cases. 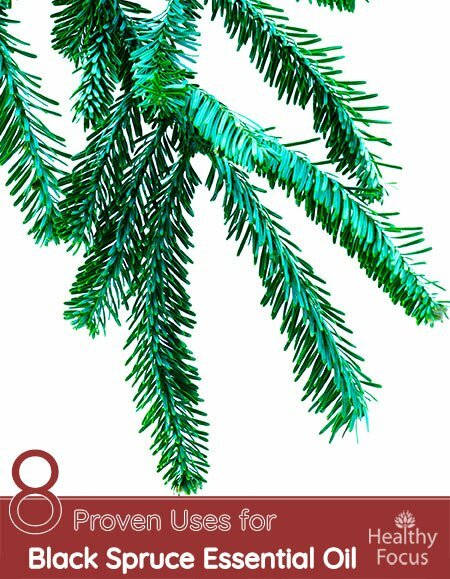 Black spruce essential oil has a wonderful, uplifting aroma. Try diffusing it around your home or office during the day or night to lift your mood. Aromatherapists who are considered experts in the field have shown that black spruce oil can be used for the management of hyperthyroidism. Hyperthyroidism is marked by symptoms such as excess hunger, tiredness, intolerance to heat, and restlessness. Some patients complain of abnormal heart rhythms, a fast heart rate, or palpitations. Insomnia is yet another symptoms of an overactive thyroid. These symptoms may subside when black spruce oil is regularly used to combat the problem. This oil blends well with certain other oils and is used primarily in aromatherapy applications. Blend the oil with oils such as clary sage, cypress, eucalyptus, galbanum, frankincense, lemon, oakmoss, rosemary, and pine. You can use the oil topically on the skin for muscle or joint pain provided that you mix it with a carrier oil such as jojoba oil, sweet almond oil, or coconut oil. In addition, the oil is used for massage purposes and applied in this way for mental and physical relaxation. When it comes to treating depression and other emotional issues, you can also benefit from inhaling the oil. There are many effective ways to inhale essential oils including direct inhalation from your hands or from the bottle or from a diffuser machine. To help treat a respiratory issue like bronchitis, the best method is to make a steam treatment. Simply add a few drops of black spruce oil to a sink filled with hot water then cover the upper half of your body with a towel. Lean over the sink and inhale the vapors for around five minutes. You can repeat this treatment several times a day for as long as necessary. This oil is considered safe to use and no known precautions are known to exist. Just avoid the use of oxidized oil as it may lead to skin irritation. As with other essential oil products, you should never use black spruce oil without diluting it first. Do not take the oil internally unless you have approval from a medical practitioner. You should also keep the oil away from children. If you do apply the oil to the body, be sure to do a small patch test first to make sure that you are not sensitive. Because there is a lack of data regarding the effects of black spruce oil on pregnancy, pregnant women should stay on the side of caution and avoid using it. The same applies to women who are breast feeding. When you use this oil, you will find that it is typically packaged in an amber glass bottle and comes with a drop reducer for easy application. If the bottle is larger, it will not feature a dropper. You can buy the oil in bottles that are one-half ounce, one ounce, or two ounces in size. Make sure that you buy your essential oils fro a reputable supplier. The oil has been proven to be an anti-inflammatory solution for getting rid of arthritis discomfort. Users like using the oil for relaxation as it does an exemplary job in this respect. The esters in the oil make it possible to feel calmer and more focused mentally. Because of the oil’s antispasmodic properties, it can be used to relieve cramping or similar physical pains. If you have trouble sleeping or you are suffering from an overactive thyroid, you can use this oil with success. You just need to make sure that you check the use of the oil out with your doctor first. You should always consult with a medical specialist when you are using any type of essential oil product. Black spruce oil is no exception to the rule. Have you ever used black spruce essential oil and what did you think of its effects? Please let us know what you used it for and how you used it. We would be delighted to hear from you.